Conventional windmills present visual problems and are not feasible to be placed within populated areas. Finding a model for a vertical axis windmill resembling a tower that blends with the urban environment presents a great source of clean energy at a low cost by requiring minimal transmission costs as it is placed very close to the consumers. The proposed model is designed and includes features that make it more effective than other models to date. To date there are no large size vertical axis windmills noticeble in in cities or anywhere else. Nor are there many small size vertical axis windmills to provide power of any significance to a city. 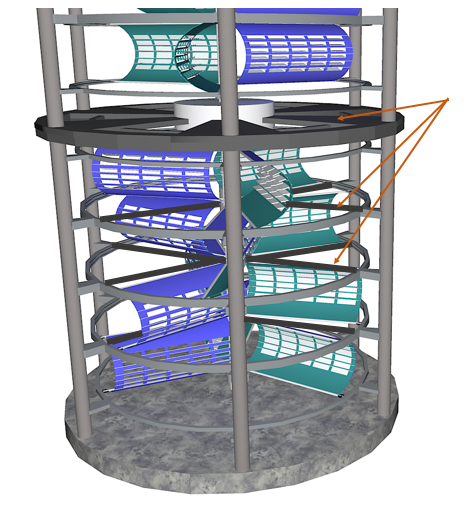 This proposal argues that with specific design features it is possible to create a model of a vertical axis windmill that can make them more competitive than conventional windmills. In the image below is a spinning "wing" that captures the wind force with shutters that CLOSE from the wind pressure on the concave side and OPEN from the wind pressure on the return/convex side (reducing resistance on the return). Wind towers capturing a large amount of energy with minimal visual impact while being close proximity to consumers (reducing transmission costs). 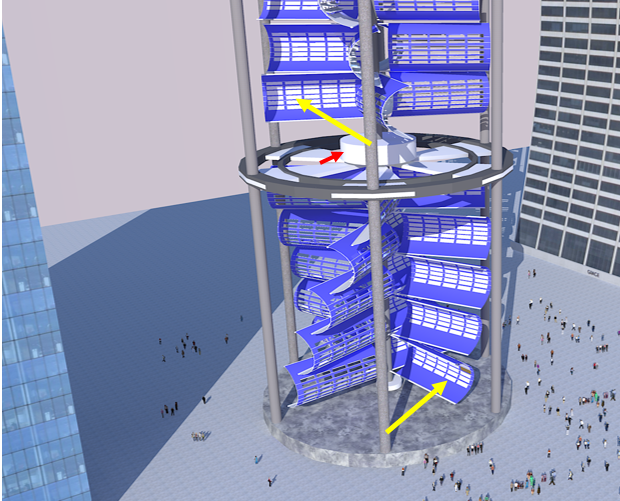 In the image below the tower is shown with "vertical blinds" - adjustable to parallel direction of the wind - designed to cover the windmills for safety and visual integration. The "blinds" also address the safety problems posed to birds by conventional windmills. City governments can invite manufacturers to run pilots in land areas that have no utility otherwise such as intersections of highways. Land concessions and regulations will depend on a variety of scenarios. In commercial areas with extensive malls or factories etc. 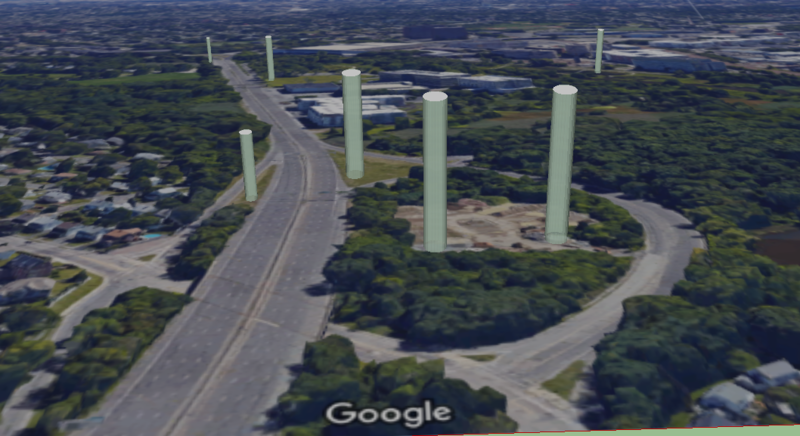 it would be simpler to implement - on a large scale - as they would be further away from residential area and the height of the towers will not have the visual impact of “looming” when built at extensive heights of over 300 meters. 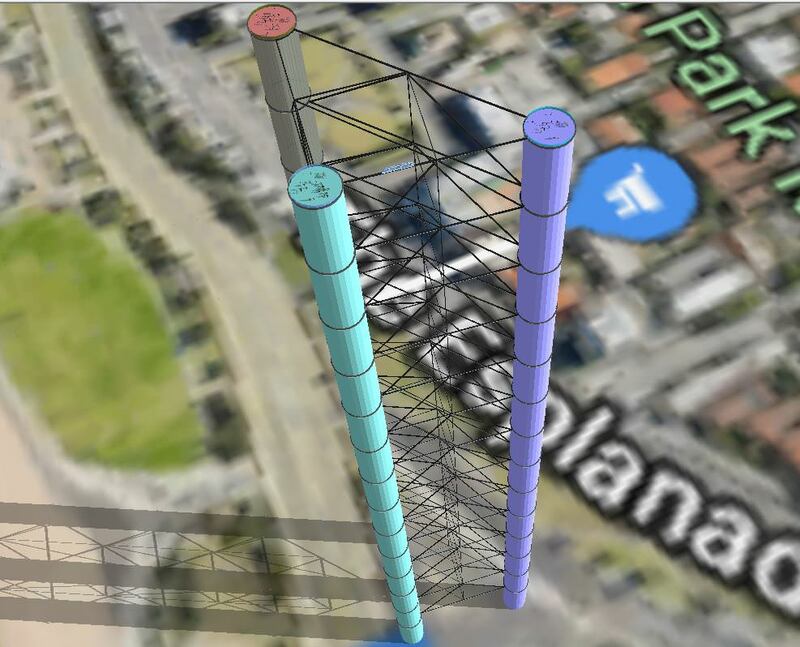 For example in the image below is an example of 300 m height in an area near highways and commercial areas. 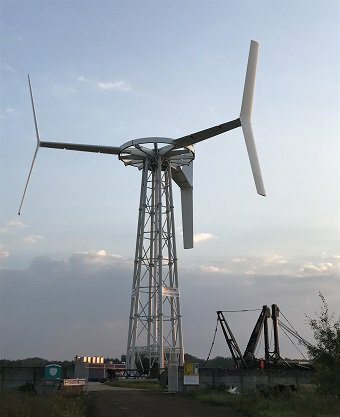 The advantage of this model is that it can be built at extreme heights without the complexities presented by horizontal axis windmills especially the transportation and the mounting of the blades such as in the image below. 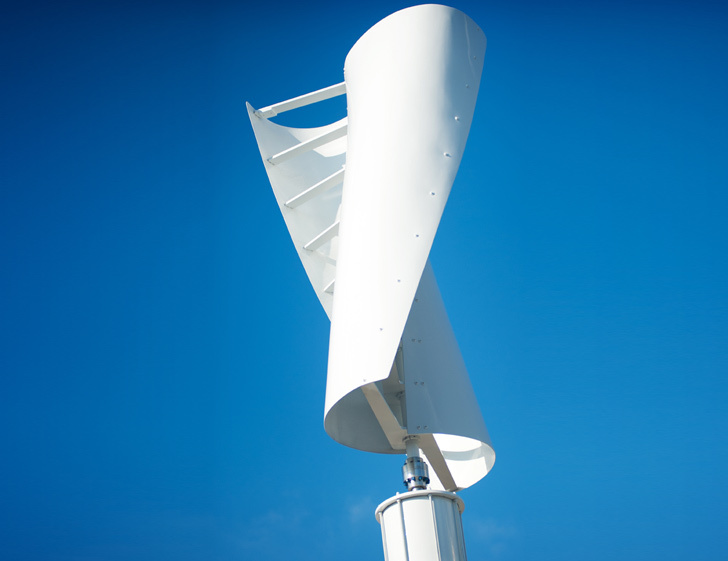 Vertical Axis Windmill with dynamic shutters that close when needed to capture wind power and open when needed to reduce resistance on the return cycle. In the image below there are two vertical axis windmills turning in opposite directions. The lower windmill can be seen with the shutters closed indicated by yellow arrow on the right side - white rectangles - while on the left side the shutters are open to minimize wind resistance until they reach into position to capture wind power again. The upper windmill turns in the opposite direction to the lower where the upper yellow arrow indicates the shutters closed to capture the wind power. the red arrow indicates the placement of the generator capturing the power from both upper and lower rotors turning in opposite directions. Stabilizers for the blades/wings: In the image below the orange arrows indicate small wheels built into the tips of the wings to turn within circular stabilizing structure indicated by green arrows. This helps keep a smooth and continuous movement. Horizontal elements (shown by arrows below) are connected to provide structural support against lateral force from the wind. 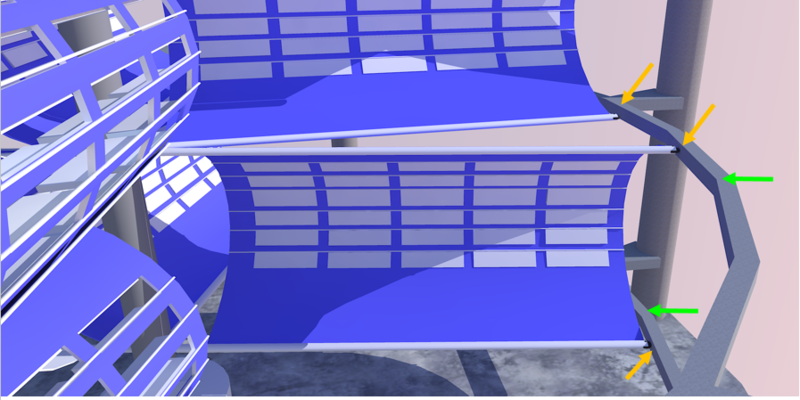 The proposed design can come in many sizes starting as small as a bird cage, to be placed in a yard or a balcony and plugged in to either fill a battery or feed into the power grid. The proposed vertical axis windmill can be placed on roofs as well as in place of concrete poles. 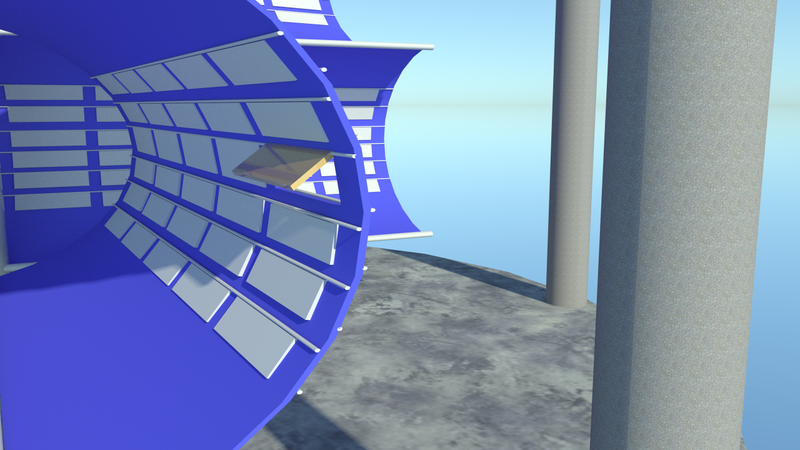 Easy to implement structures - in comparison to horizontal axis windmills. At a large scale the model can also serve as an attraction. City governments would work with energy suppliers - who in turn would work with manufacturers to provide added energy to the grid. NOTE there are many sizes for the model - Vertical Axis Windmill with Shutters and Blinds - which can fit in a variety of areas including in rotaries, industrial areas and even on streets in place of current concrete poles. City authorities that seek to convert to green energy may provide the rights to the various spaces - and regulations to ensure no noise, and other interference. The vertical axis windmill model an fit in a variety of areas from rooftops to sidewalks and open areas within cities. Best fit areas are spaces that have no other use, especially the vast number of highway intersections that take up extensive land. The vertical axis windmill model, if placed across a city including in place of concrete poles. on rooftops and in open spaces such as parking lots can provide vast amounts of energy. 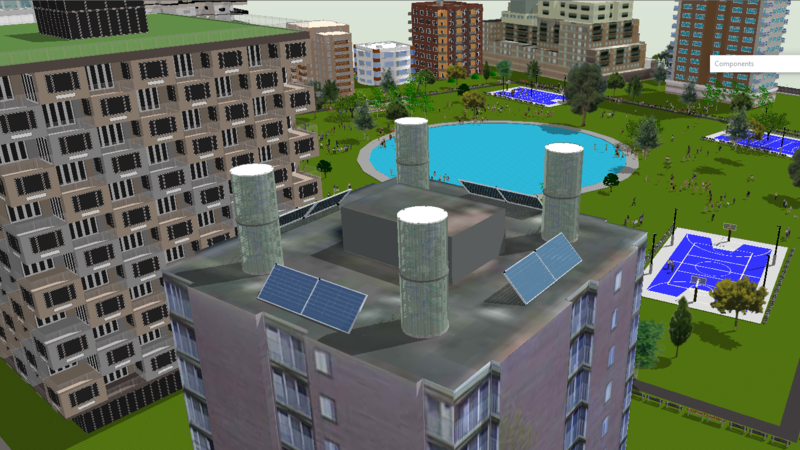 In combination with extensive solar energy in a city the model may provide a large portion of the energy needed to convert to a city clean energy in it's entirety. 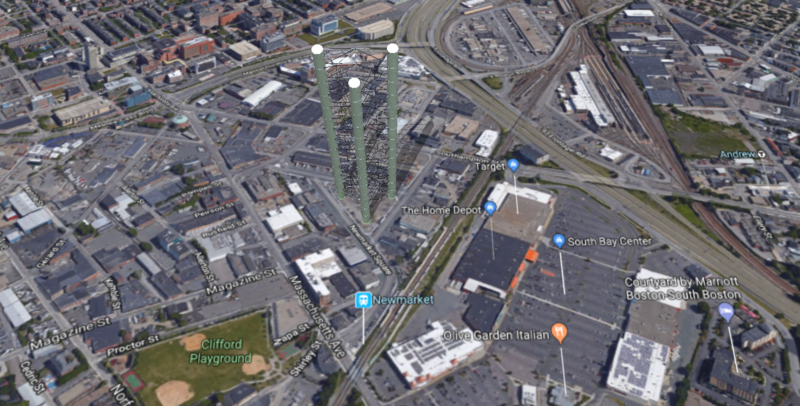 It would be difficult to calculate the impact with accuracy - but it it is reasonable to assume that a city such as Metro Boston can build at least a few hundred large scale windmills (about 1000 FT height - 100 FT diameter) and many more at a smaller scales. The most powerful conventional windmill powers about 8000 homes and is less than 1000 FT tall. The proposed model at a 1000 FT and with the large scale dynamic "wings/flappers" can arguably provide at least the same power. 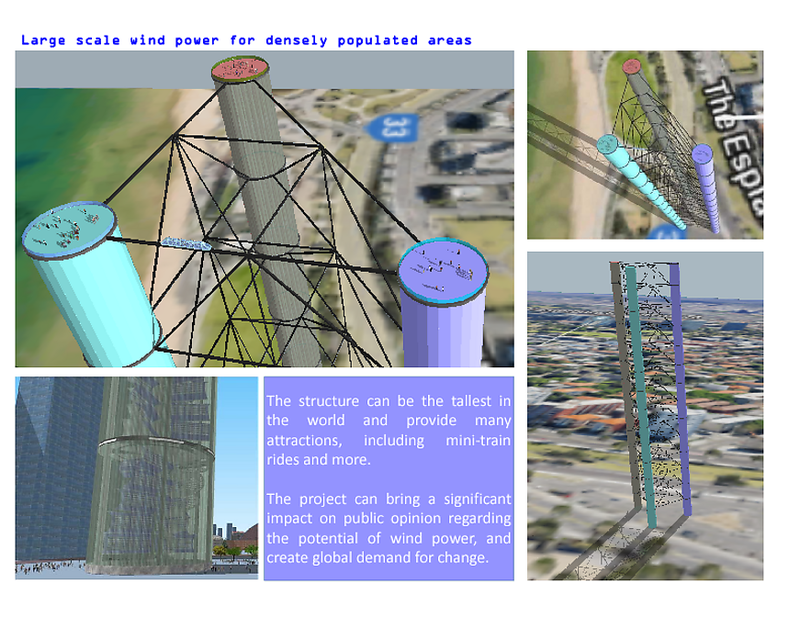 A metro area such as Boston can easily power over 1 million homes by implementing a few hundred Dynamic Vertical Axis Windmills. 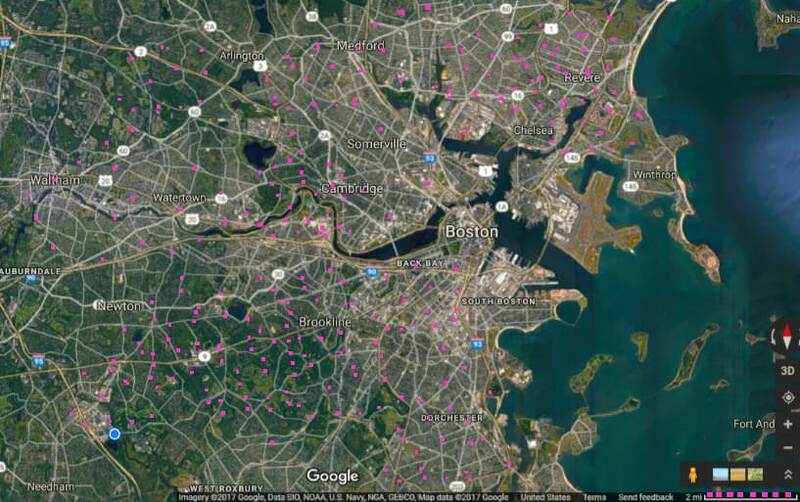 A metro area such as Boston can eliminate the use of fossil fuels to power homes by implementing large scale windmills of the proposed model in less than a decade - combined with use of battery technology as well as solar power. 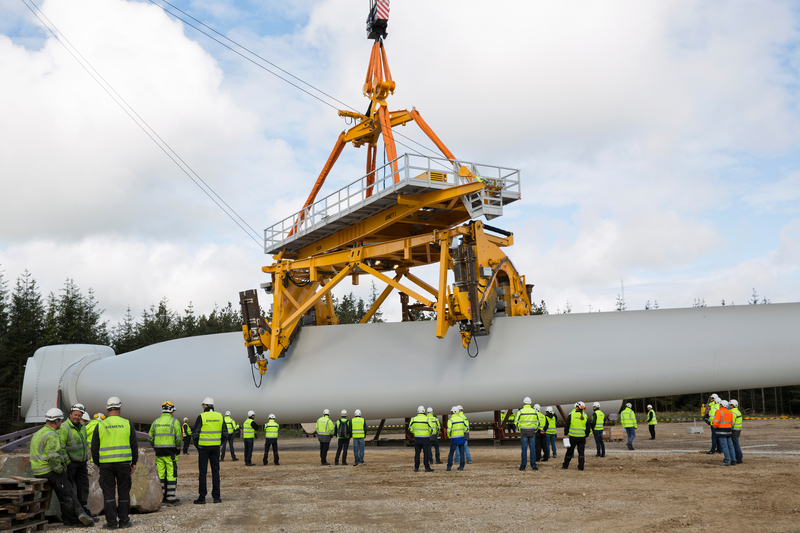 The advantage of this model is that it can be built to extreme heights without the complexities presented by horizontal axis windmills especially the transportation and the mounting of the blades such as in the image below. LOW COST CONSTRUCTION AND MAINTENANCE - Simpler and more cost effective maintenance. Workers can access all areas via stairs or even elevators. 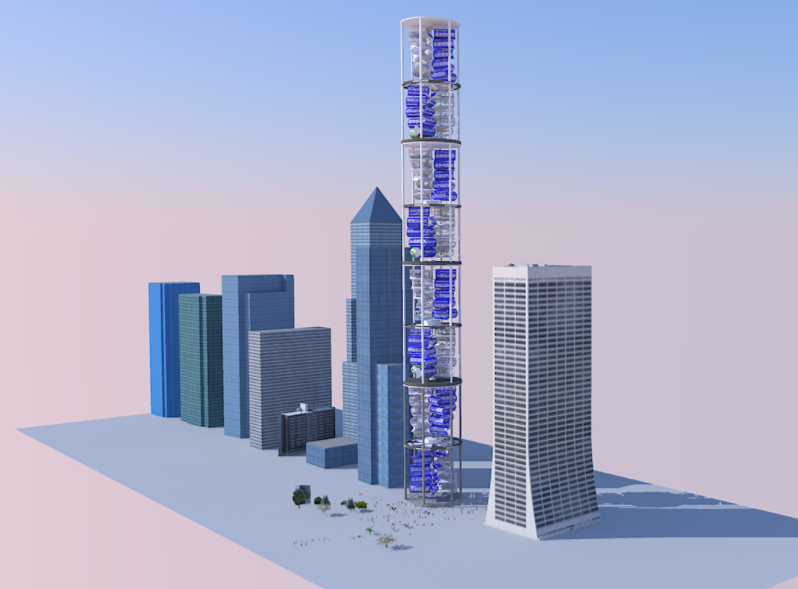 the proposed model can be built with simpler technologies and easy assembly reaching at least to heights equal to some of the tallest buildings and more. 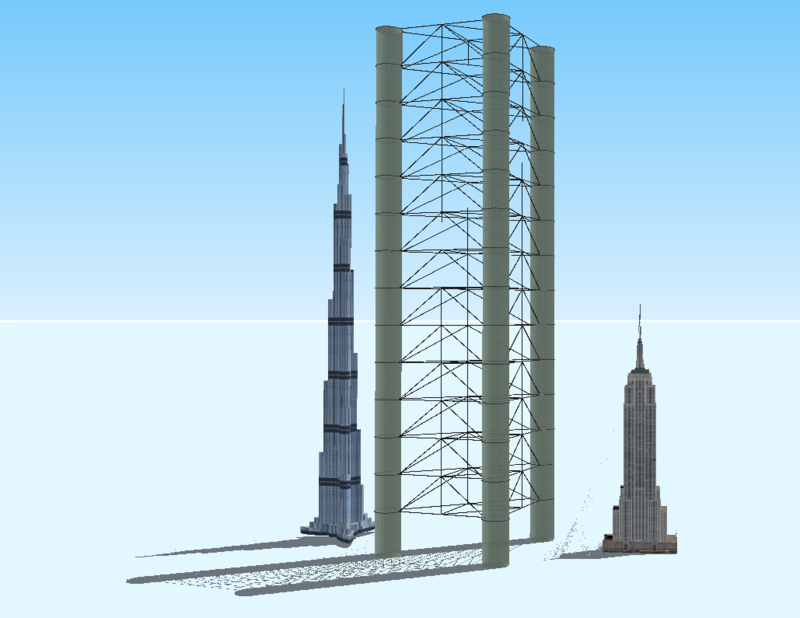 In the image below is an example of three towers connected for structural stability. Significantly less expensive (possibly as much as by a factor of 10) to implement than the equivalent output from horizontal axis windmill. Parts can be manufactured, transported and assembled more quickly and cheaply. The structure is more efficient, and can reach greater heights, and more organic to create than horizontal axis windmills. 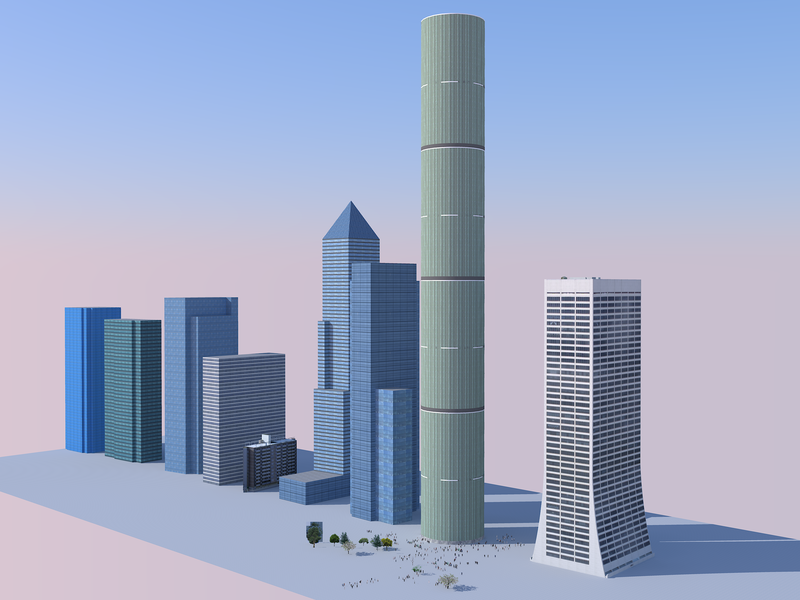 Within less than five years a city can build a large number of the proposed model in a variety of sizes to the extent that it could supply half the energy for a city. Within 15 years, using existing battery technologies the model can meet most if not all the energy needs of a city that is located in the vicinity of an ocean or other areas that have significant wind. Emil Jacob, owner and founder of Jacob Innovations LLC, design firm in Cambridge, MA. Undergraduate degree in Economics from the University of Toronto and has worked extensively in IT as a Business Systems Analyst finding innovative ways to streamline and automate operations through software and optimized interfaces. I am a strong believer in simple solutions to overwhelming challenges, most importantly climate change. I am particularly concerned about the cataclysmic scenario of runaway global warming hence I believe that all efforts are vital. Especially concerted efforts by multiple entities and large numbers of contributors - such as the CoLab Competition.